CLYF is private non-profit organization. Since we receive no public funding, most of our operating budget comes from people like you. Our staff are volunteers and we strive to keep equipment in the best possible condition with replacements that are made every season. Your donations will help give the children in our programs the opportunity to participate in scholarship level football at an affordable price. Every dollar makes a difference in the life of child. We count on and appreciate your financial support. We also collect tangible items for sale at our concession stand or equipment used by the players & cheerleaders. 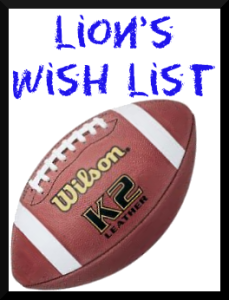 View our Wish List for items we need.